Dr. Mateo Lino graduated from the Canadian Memorial Chiropractic College in Toronto in 2018 and is the newest addition to a spectacular team at Dunrobin Family Chiropractic. Before that, he graduated from York University in Toronto in 2011 with a Specialized Honours Bachelor of Science in Kinesiology & Health Science. Dr. Lino is committed to providing the highest quality of care to help each member of his community, achieve optimal health and maximal performance via the most hands-on, natural approaches. After graduating from University, Dr. Lino took some time to work in the Fitness Industry as a Fitness Advisor and then as an Assistant General Manager with GoodLife Fitness. His aim was to help as many people as possible achieve their optimal self by improving their health in a most natural way. Meanwhile, having battled a few sports injuries from his youth, he started seeking out alternative forms of healthcare. Growing up, Dr. Lino loved to play football, was a provincial wrestler, an avid soccer player, and picked up running after a knee injury, as a form of rehab. Between competitions, practice, dry-land training in the weight room, and other recreational activities, he accumulated all sorts of injuries throughout his body spanning from his mid-back, low back, hips, knees, and shoulders. He sought after different types of care, none of which were offering the relief and benefit his body required. He then discovered Chiropractic Care. He found Chiropractic Care the most rejuvenating, hands-on, thorough approach to his health, allowing his body to function better and heal faster. He soon felt he was able to train better, compete faster, perform at a higher level, and even think clearer. This is when he decided to become a Doctor of Chiropractic, so he can more effectively help others be the best version of themselves. While studying to become a Chiropractor, Dr. Lino worked as a Personal Trainer, organized group Boot-Camp workouts in the summers, worked as an In-Home Personal Trainer with Nielsen Fitness, and tutored Biochemistry, Physiology and Radiology at CMCC. At the same time, he volunteered with Toronto Rehab Institute’s Musculoskeletal and Acquired Brain Injury units helping individuals recover from very invasive and life-altering procedures, volunteered with the North York Senior’s Centre, and as a track and field coach with the Ontario Special Olympics’ North York Jets. 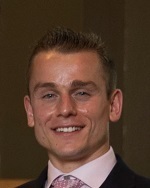 During his last year at CMCC, he interned at St. Michael’s Hospital providing Chiropractic Care to patients with chronic pain, interned at CMCC’s Campus Clinic caring for students and athletes overcoming injuries/barriers to their performance, and interned at the Aptus Treatment Centre delivering Chiropractic Care to adults with neurodevelopmental disabilities. He’s had plenty of experience working with families, young kids, adults, athletes, and seniors, and would like to care for every member of our community. Upon graduation, he has been working as a Medical Therapist with the Ontario Soccer Association’s OPDL (Ontario Player Development League), providing on-field support to girls and boys under 17 years of age. On his free time, he loves to play all sorts of sports, especially soccer, go to the gym, and train to run a sub-3-hour marathon to qualify for the Boston Marathon. Dr. Lino grew up in Toronto where he met his wife, but the two of them have always wanted to live in a more tight-knit community, where starting and raising a family of their own would be more nourishing. Dunrobin, West Carleton, and the Ottawa area is exactly what they have been looking for. Dr. Lino’s mission is to optimize the health and performance of every member in our community through natural Chiropractic Care. He looks forward to helping you through your health.